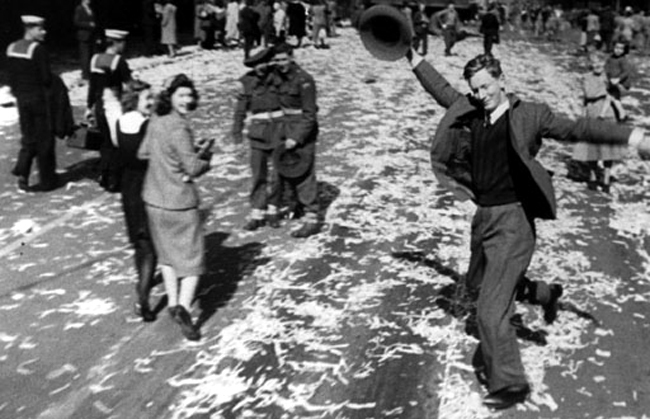 Sydney celebrates the end of the war against the Japanese on August 15 1945. The famous dancing man shot in Elizabeth Street Sydney. WHILE the Illawarra region marked the end of the war in the Pacific on August 15 1945 with “well-behaved” celebrations, the good folk out Austinmer way went a little further, staging a mock trial of the Japanese Emperor Hirohito, and later setting his effigy on fire. Not all was so dramatic though, and after the flames died and the effigy smouldered, the Austi folk sang and handed out free ice cream and crackers to the children. Large crowds assembled in practically every centre of the district on Wednesday night to celebrate the end of the war with Japan. Community singing and dancing were the most popular methods of the celebrations. In addition, particularly large crowds attended the various services of Thanksgiving. BULLI SHIRE: A thanksgiving service was held at Thirroul Soldiers’ Hall yesterday and was conducted by members of the Ministers’ Fraternal, while a special thanksgiving service was held at Ball’s Paddock, Woonona yesterday morning and was again conducted by members of the Ministers’ Fraternal. The sermon was given by Capt. Bugler, of the Salvation Army, who based his address on the life of King David. Speaking at the service at Ball’s Paddock, Cr. C. Quilkey said they were gathered to offer thanks to God for a deliverance from something that could have been, worse than death itself. They remembered, he said, the time when the British nation stood alone against the enemy and they remembered too, the time when the Jap threat was so great to Australia. It was with pardonable pride that they looked back on the achievement of the Australian services and remembered that it was the Australians who first stopped the Japs in New Guinea and started them on their retreat towards their home lands. They recalled, too, the deeds of the Australians in the Middle East. The sympathy of the whole community, he said, went out to the relatives of those who had paid the supreme sacrifice, and they rejoiced with those whose relatives had been P.O.W. in Japanese hands, and. whose anxiety was now much alleviated. To-day we dedicate our thanks to the men and women of the services, and we, also pay tribute to the work of the civil services who have done wonderful work, he said, and added that although the war is ended the work of the Red Cross, W.V.S. and A.C.F. would still have to go on. “We must see to it that the world is made fit for all to live in, and to do that it will take the co-operation of all the people. As we have organised for war, so, too, must we organise for peace,” he declared. “If we are to be worthy of the victory, we must be worthy of the peace and see to it that the war which was won for the freedom of the people has not been in vain,” Cr. Quilkey concluded. During the service appropriate hymns were sung, the music being supplied by the Woonona-Bulli and Salvation Army Bands. 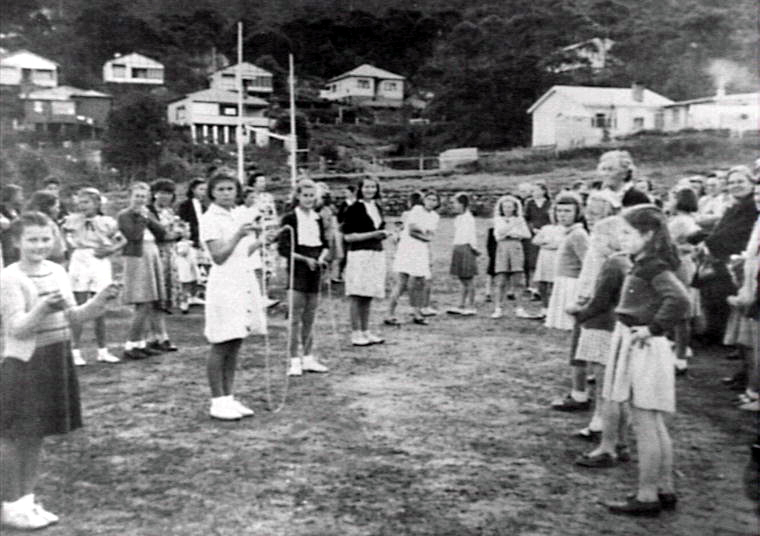 Throughout the Bulli Shire celebrations were held, and although of a joyous nature, there was nowhere any indication of vandalism or wanton destruction. Police stated that the crowds were amongst the best behaved that they had ever seen. Processions were held at Coledale, Thirroul and Bulli on Wednesday night, and at Coledale and Bulli bonfires were lighted and community singing enjoyed. At Thirroul there was a dance in the Soldiers’ Hall, and at all towns in the Shire there was singing and dancing in the streets. The Woonona-Bulli Band, travelling on a lorry, played in the streets of Thirroul, Bulli and Woonona. Special services were held in all churches, some on Wednesday and, others on Thursday night. At Woonona and Thirroul special children’s days were organised for yesterday, when free drinks and sweets were supplied and there were various competitive events. At Austinmer on Wednesday night the citizens held a mock trial and after condemning Hirohito to death burnt his effigy. Community singing was held and free ice cream and crackers were given to the children. At Corrimal the celebrations took the form of a monster sports and athletics day for the children of the whole of North Illawarra Municipality, and at which ice cream, drinks, etc., were distributed free. Dances were also held in the three halls in Corrimal. The proceedings started with a thanksgiving service at which the address was given by Rev. 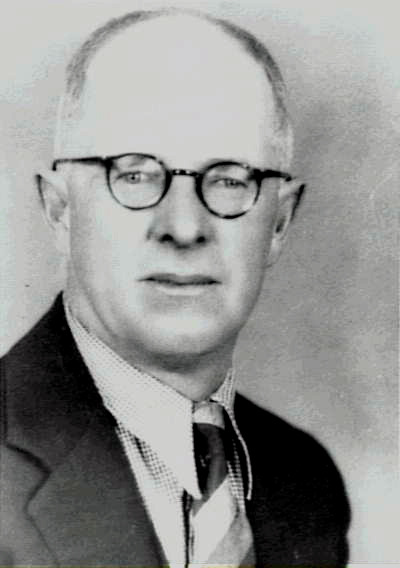 R. D. Birch. Last night there was a bon fire display in the Memorial Park; and this was coupled with community singing and a concert by district artists. Although district ambulance services stood by throughout the peace celebrations in this district their services were not called on for any serious accident.